This stately Federal was built by Captain Joseph Wilson in 1840 and restored to perfection in 2010. Located in Thomaston, a town known for its shipbuilding prowess and home to two of the seven recorded millionaires in the United States in the late 1800’s, the Captain Wilson house boasts a professionally decorated interior, bedrooms to sleep 12, a gourmet kitchen, a private a spacious back yard and a location offering a village experience with water front activities within a 5 minute drive. The house is large and spacious with truly luxurious accommodations. A center hall way is flanked on the right by a formal sitting room with a propane fireplace and a larger sitting room/ office for those who may need to work during their time away. There is a first floor bedroom with a queen which is adjacent to the full hall bathroom. This bathroom has a Jacuzzi tub/shower combination. A truly stunning dining room is right off the kitchen with seating for 12. Find original woodwork and built-in cabinets throughout the house – the dining room has particularly beautiful examples of antique craftsmanship. The kitchen is large and inviting with a table for eating in-kitchen – professional appliances and lots of counter space make this a very workable enjoyable kitchen to prepare meals of any size in. A den at the back of the house – with a television and DVD player – is a quiet room for those who may want to relax and watch a game or a movie during their stay. Upstairs, find a graceful master bedroom with a large private bathroom and a queen bed. The shower is large and custom built. The second bedroom also has a queen bed and shares a hall bathroom with a shower. The third bedroom has two twins and a private bathroom with a tiled shower. At the back of the house, there is a large open room that has 4 twin beds – this is a fantastic room for kids. The house has cable television and wireless Internet. There is a patio at the back of the property with patio furniture. Bedroom/Sleeping: All properties provide bedding and bath towels. 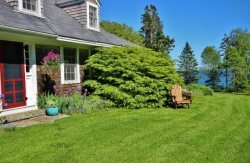 Coastal/Shore Proximity: 1 Mile to Harbor.